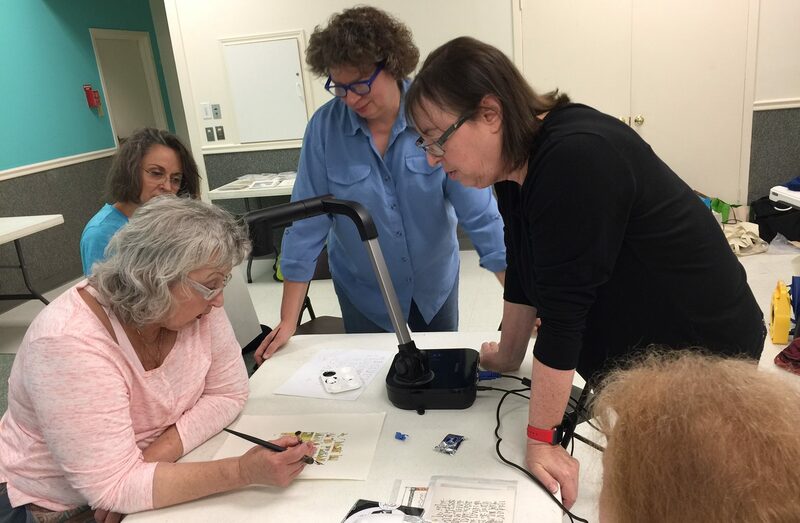 The Major Workshop program brings world-class calligraphy instructors to San Antonio and enables our members to take these workshops at a very reasonable cost. Usually, we plan 2-3 major workshops per year. 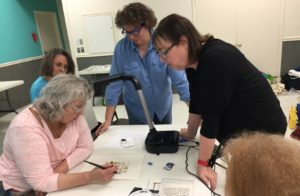 Workshops typically last two days: Saturday and Sunday from 9:00 a.m. to approximately 4:30 p.m. Major Workshop fees vary due to the instructor’s fee and transportation. 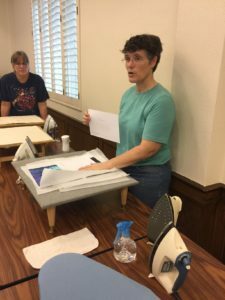 Beth Morton teaches how to create book cloth. View the highlights from our some of our past Major Workshops! Unless otherwise announced, Major Workshops are held at The Discovery School, 222 Salem Drive, San Antonio, TX 78201. Participants arrive 15-30 minutes early to get set up and be ready to work at class start time. Participants stay between 15 and 30 minutes after the end of class to help clean the room before we leave. Meals, snacks and drinks are on your own; however, it is customary to bring food and utensils to share with others. It’s safe to say that no one goes hungry in our workshops . The Discovery School has excellent kitchen facilities, including a refrigerator, microwave, and some utensils. There are also picnic tables available in a covered area outside. Feel free to use these items as you like, but leave them as you found them. There are several private restrooms available for your use at the Discovery School. We share lots of things between participants at workshops, and many people have identical tools. Before class, permanently mark all your tools with your initials so they don’t get mixed up with others. It’s also a good idea to initial your papers and handouts as you receive them. Some additional things you might bring for your comfort. We love to have fun and share ideas during workshops. But as a courtesy to the instructor and to other participants, please refrain from talking while the instructor is lecturing or demonstrating, and talk quietly at our seats when others are working. Put cell phones on vibrate or silent mode and take all calls only outside of the classroom. We take the class experience seriously and discourage visitors who may interrupt the flow of the class or the concentration of the participants. It is your choice if you want to leave your supplies, tools and class materials in the Discovery School classroom overnight during a two-day workshop. However, do not leave any expensive items such as laptops, cameras or printers overnight. As with any other Guild activity or policy, we are always open to questions and feedback. Please contact the Major Workshop Chair. Workshops begin promptly at 9:00 AM and end at approximately 4:30 PM, unless otherwise set by the instructor. Doors will be opened by 8:30 AM. Fees vary and will be announced by the Workshop Chairperson at the earliest opportunity. Fees must be paid before the workshop begins. Each workshop slot is filled on a “first-check-received” basis. Checks should be given or mailed to the Major Workshop Chairperson. At the time of payment, participants will receive a receipt. They should bring the receipt to the workshop in case there are any questions regarding payment. Checks should be made payable to SACG. Please note workshop title on the check. Anyone attending Workshops (including instructors’ assistants) are required to pay the workshop fee. San Antonio Guild members have priority for workshop slots. An additional fee will be charged to non-members. Workshop fees will not be refunded unless the registrant’s place is filled from the waiting list. If a place is filled from the waiting list, the canceling participant’s check will be returned after the workshop. If no one is available from the waiting list, the registrant may designate an individual to fill his or her place. The Workshop Chairperson or the instructor may limit the number of participants in a workshop. The Workshop Chairperson is responsible for collecting all workshop fees and keeping registration/waiting lists. The Workshop Chairperson is responsible for identifying and making rental arrangements for the workshop classroom. Sign-up, payment, logistics, publicity, changes, finances and attendance matters are handled by the Committee Chair for that program, with the support of other Board members as needed. If changes arise, they are announced at the general meeting and publicized in the newsletter. In extreme emergencies (like serious weather events, power outages, etc. ), the Committee Chair makes every effort to contact participants personally by phone, email or text.